SC Senator Jim DeMint has resigned, affective in January. YEAH! YIPPEE! While I will be glad to be rid of the President of the Senate Tea Party Caucus and have his shadow removed from SC leadership, now I have to worry about who Governor Nikki Haley will appoint to the position. She is as far right as DeMint, if not further, and is liable to appoint some other obstructionist, anti-government Tea Party nut-job. 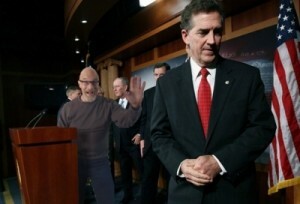 Bye Bye DeMint. Don’t let the door hit you on the way out.